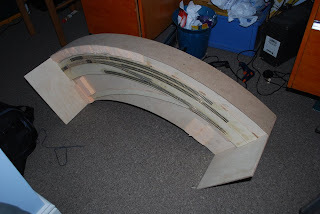 Having prepared the Tortoise machines and the baseboards as mentioned last time, I proceed to fit the two together. This proves fairly straightforward although the template provided with the motors was of no use; I found I had to position an actual motor and hold it whilst making sure the throw either way was sufficient. I then marked its position before drilling and screwing. The motor control will not, I have decided, be DCC. 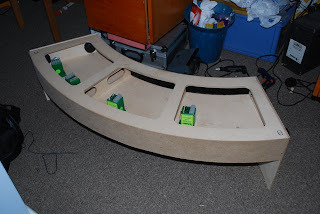 Instead a small panel will be mounted on the baseboard to control the points mimicking the lever-frame on the prototype. I also today chipped my Cl108 DMU. All fairly easy apart from the initial removal of the power unit body; it seemed to be tack-glued to the motor unit. Anyway, more progress tomorrow. I hope! Tony, if you opt for 'Hare' decoders for your Tortoises you can easily enjoy the benefits of both conventional panel and DCC turnout control. The Hare is a push fit on to the Tortoise terminal card and can simply be wired straight into the main DCC bus with no need for a seperate power supply. The Hare has terminals for panel mounted switches for conventional control as well. It also has an 'auto-throw' feature which overcomes what I consider to be the biggest downside of DCC train control - short circuit system shut-downs due to driving a train into a turnout that is set against it. Thank you. This looks like a good way forward. Cheers for the pointer. Wabbits are also worth a look, which are two Hares in one package, so can be a bit cheaper. If not wanting the "advanced" features (remote buttons, auto switching) of Wabbits/Hares then they are very expensive for an accessory decoder. If using them, they can be invaluable. The short circuit shut-down issue can be solved by "power districts". Use a separate power breaker for the layout track feed, and optionally another for the turnout feeds (the turnout motors are less likely to short, so the breaker is optional). Thus, a track short does not shut down the command station. A DCC breaker shouldn't cost more than £30. The better ones are tunable for the current to trip, so can be turned down to the currents appropriate for 2mm locos, rather than the brutal 3 to 5 amps of most command stations.